Writing a sentence is like making a sandwich. You need the bread (the subject) and the meat or peanut butter (the verb). 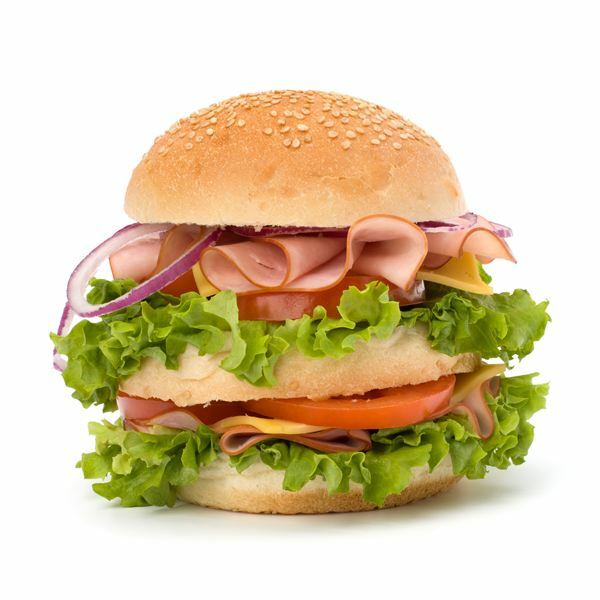 Then to make the sandwich more exciting you might add lettuce, mayonnaise or jelly (adjectives and adverbs.) This lesson will help the students understand the concept of a complete sentence. Subject: The subject of a sentence is the person, place, thing or idea that is doing or being something. Verb: A verb tells what the subject does or is. A cat ran up a tree. Jack skipped up the hill. Say, “Today we are going to talk about what makes a sentence. We all know what words are. A sentence is a group of words that is complete in itself. Let’s look at what I have written on the board and you will see what I mean." “In each sentence there should be a noun or subject, which means a person, place, thing or idea. Also there should be a verb, which describes what the noun is doing or what the noun is. Discuss each example and lead the students to understand that the sentence at least has a subject and a verb. 1. Give the students the magazines, scissors, glue stick, and 4"x4" construction paper. Allow only 15 minutes for them to find two nouns, cut them out and glue them to the construction paper. You may want to hold up a magazine and give them a few examples. 2. Gather the papers and place them face down on the floor or table. Instruct students to choose one square and return to their desks. 3. Instruct the students to look at their nouns and come up with one verb that tells what the noun is doing or what the noun is. Have each student stand and share. Then ask another student to put the words together in a short sentence. Another student says, “The baby is crying." Say, “You remember that yesterday we talked about sentences. Writing a sentence is like making a sandwich. The bread is the noun or subject. The meat is the verb. You need both. But sometimes we like to have more things on the sandwich: lettuce, mayonnaise, ketchup or cheese. For a sentence, extra words that describe the subject or the verb can be added." Hold up a few of the cards from yesterday. Ask for suggestions of words that could describe the nouns. For example, you could say the shiny car or the furry cat. Write a few examples on the board as you brainstorm. Next ask for verbs, words that describe what the noun is or is doing. For example, “The shiny car stopped." Now think of words to describe the verb. How did the car stop? Quickly? Slowly? Say, “Do you think the extra words make the sentences more interesting? Are they still complete sentences? How do you know? Notice that when I have written the complete sentence I put a capital (upper case) letter at the beginning and a punctuation mark at the end. That can be a period, a question mark or an exclamation mark. Place the cards on the floor facedown again. Students should choose a card. The assignment is to write a sentence about the picture using a noun (subject), adjective (to describe the noun), verb, adverb (describes the verb). Remember to use a capital letter and punctuation at the end of the sentence. Bring papers individually to share with the teacher. When writing a paragraph on the board, write each sentence with a different color marker. This way the students can visualize each complete sentence. Write a complete sentence on a sentence strip. Then cut it into segments. Pass out the pieces and ask those few holding the pieces to put them in order to make a complete sentence. Present it to the class. McKerns, Dorothy and Motchkavitz, Leslie. The Kid’s Guide to Good Grammar. Lowell House, 1998.